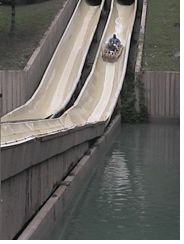 Mountain Slidewinder is a flume ride in Owens Farm at Dollywood. While it's not the best, it is also recommended. The minimum height to ride is 39 inches. Foam toboggans take riders down a watery trough.It's a long hike up, but some say it's the best non-rollercoaster, fast thrill-ride in the USA. You will get wet and possibly drenched to the skin!